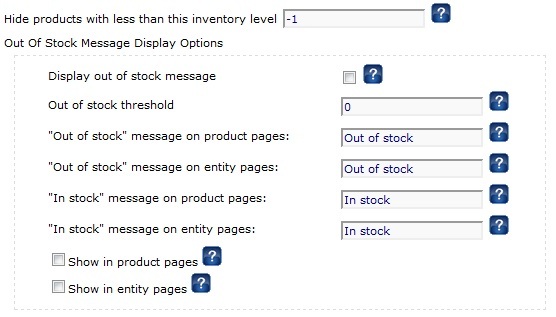 Hide products with less than this inventory level - If this option is selected, products with an inventory less than the quantity specified will be hidden from all customers. Set the quantity to -1 to disable inventory tracking. The final section controls how kit options that are tied to existing variants are handled. See this page for details on how variants can be tied to kit options. Enable stock hints - If this option is checked, each kit item will show Yes/No next to it for in stock or out of stock status. Store admins will see actual inventory counts. Disable Item Selection if out of stock If selected, kit items that are out of stock will be visible in kit groups, but not selectable. Hide Out of Stock Item options If selected, kit items that are out of stock won't appear in kit groups. None This option will allow out of stock kit items to be selected and purchased.